Food Newcastle is an inclusive group of stakeholders representing all parts of the food system and working together to achieve the aims of the Newcastle Good Food Plan. The Co-ordinators; are at the core of Food Newcastle bringing individuals, initiatives and organisations together, alongside organising the day to day running e.g. meetings, events, marketing and communications (website, social media and correspondence). The Partnership Group; overseen by a chairperson and is then divided into 6 themed sub-groups in accordance with the Good Food Plan. Each of the sub-groups are represented by leads who provide administration, consultation on and development of action plans, and deliver on agreed priorities. The partnership group comes together at quarterly meetings, events and activities to discuss and action the progress and future of Food Newcastle. 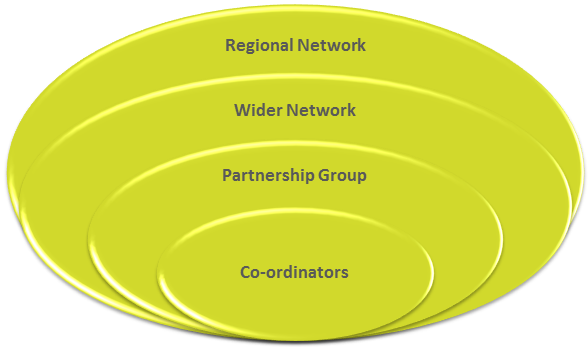 The Wider Network: This section consists of initiatives, organisations and individuals with a passion, interest or remit around various aspects of good food. These partners tend to be working towards a one or more of the good food plan theme subgroups through projects/campaigns. It is this work at grass route level that contributes to the sustainable food cities award and sets the standards for cross city changes. The Regional Network: We have links with cities in the North East that are doing incredible work dealing with social, economic and environmental challenges transforming their food culture and food system. Food Newcastle is looking to develop communications with neighbouring cites as we believe by taking a joined up approach, learning from others, sharing ideas and developing good practice, it will drive forward positive food changes to find solutions.